Finished Oct 2018. Final score: 4 / 5. I look forward to applying these negotiating techniques. Chris Voss was an FBI hostage negotiator for many years before moving to the private sector. A few interesting points about negotiating with dangerous criminals. Failure to come to an agreement is not an option. The opponent is irrational and unstable. He goes in to more details which I won't cover because I am not qualified to comment. The most tense negotiating I've experienced is what most of us are familiar with: freelance gigs, salaries, houses, and cars. Chris Voss is quite full of himself. Much of the content is him bragging about how sweet his negotiating skills are. He talks about his amazing work in the FBI. He talks about his former students emailing him about how his awesome skills are helping them. Then he talks about mopping the floors of the top Harvard students. OK, I get it. You are good at what you do. Please start telling me some techniques. Use empathy and a calming voice. The opponent wants to be understood, so try and relay it back to him. Take as much time as needed. You want to become his friend. Make the opponent solve your problem for you. Instead of a direct no, say "How am I supposed to do that?" 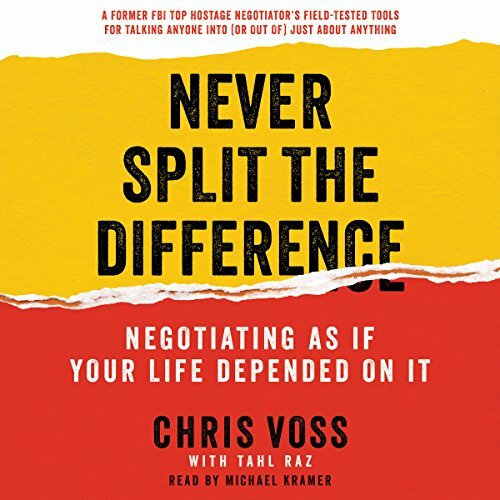 Learn what Chris Voss calls the "Ackerman Bargaining Method". It's a form of price-anchoring and then reduced price volleys to an oddly exact looking number. This piece was the most interesting to me. I walked away from this book feeling like I might have saved some money on my last car purchase if I knew these techniques. The book was good, but I felt like half the content could've been dropped. It'd be nice if Chris Voss released a targeted version that directly catered to us mortals (cars, houses, and salaries). This book felt like 50% boasting, 20% ads for his consulting company, and then 30% truly useful techniques. The book gets a 4 because the superfluous stuff did have a touch of entertainment to it. Discuss Never Split the Difference in the forums.